Cleveland native Monte Gaddis took matters into his own hands in hopes of landing a tryout with his hometown Browns. Monte Gaddis is willing to do whatever it takes to get a chance at an NFL tryout, even if it means standing outside his local team’s facility in the rain all day. Gaddis, a Cleveland native and college teammate of ex-Browns running back Terrance West, pledged to wait outside of Browns headquarters all week with his homemade cardboard sign until he got an answer. By the third day, he got his first taste of success. Joe Haden spotted Gaddis on Monday and thinking he was looking to raise money for a local football program, offered to donate money. Gaddis refused, telling Haden that he was seeking a tryout. After a rainy Tuesday, Gaddis finally got what he was looking for. Browns general manager Ray Farmer emerged from the team’s offices on Wednesday and told Gaddis he didn’t have to take such extreme measures to get noticed. #Day2….. This has been a crazy experience that I'm ready to turn into reality. Im out here standing in the rain lol I'm starving for this. To be honest, this has been closest I've felt being near the NFL since draft day 2014. When I do get picked up by a team, it will not only be because of the support I get but people are finally starting to see my vision, hard work & preparation for this. I even met Joe Haden yesterday, he offered me money because him and his wife thought I was starting my own football team 😂. Didn't accept the money, that tryout was worth more than that. We both showed great character, much respect. Everybody saying they would of took the money, but I'm thinking longevity. I could have a locker right next to him, gotta keep it 💯. Real is real! I speak respectively to everyone by saying good morning & event to the people that drive by and honk the horn. If you check all my social networks you would know this is my dream and I'd anything for that chance to play at the highest level. We have plenty of millionaires from Cleveland, but how many can you count on one hand that actually come back or even give back to the community??? I haven't played on tv in 2 years but I know my city knows me because of how I actually #GiveBack & wants to see my city grow. Not judging anyone, but they have the money to easily give back. I barely have $4 in my pockets and still living in the hood but I make sure my family & city is good. Positivity spreads quick, this could be a life changing story for me and someone who I inspire! 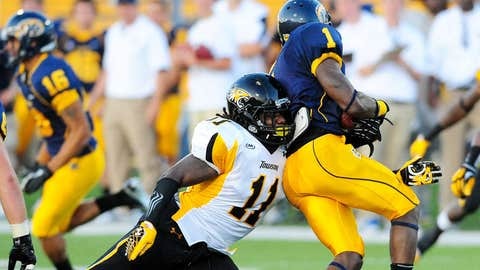 I'm out here in my Towson University jersey, 2012 All-American. Just to bring back memories and feel it again. But if you really want to be motivated, read what supporters and strangers are saying under the pics I'm tagged in. Very touching💯 Please keep supporting me! I won't let you down, I know once they see me perform they will love my athleticism and work ethic. Even if the Cleveland Browns don't pick me up, someone will see my hunger and see how valuable I can be for a team. "I told him I felt this was the best route I had since I didn’t have an agent or anything," Gaddis told Cleveland.com. "I told him, ‘Hey, it got you to come across the street to talk to me. I think I did a good job.’ He chuckled, so it was a good feeling." After chatting for a few minutes, Farmer asked Gaddis for some game tape. Only problem was Gaddis didn’t have it with him. Farmer said to deliver it the next day, but Gaddis raced right home to grab it. "The one thing I’m waiting for is that tryout," Gaddis said. "That’s all I’m waiting for. I know they’re going to love me. The city is behind me. I have all of the support. I just hope the coaching staff feels the same way." Gaddis is looking to make it as a safety after starring at linebacker for Towson University. Without so much as a sniff of an NFL tryout, he played overseas earlier this year in the Polish American Football League. After reading about free agent receiver Joe Anderson camping outside the headquarters of the Houston Texans, he decided to employ a similar strategy, with some added encouragement from West. "He said, ‘You have nothing to lose. Why not?’ " Gaddis said. "When he said that, it just clicked a little button in my head, like, ‘I’m going to go with this and not look back.’ "
Gaddis’ chances may be slim-to-none, but kudos to Farmer for being open minded enough to at least take a look. It would be an amazing story if Gaddis did catch on, but it would be even crazier if he made it with another team after getting ignored by his hometown squad.